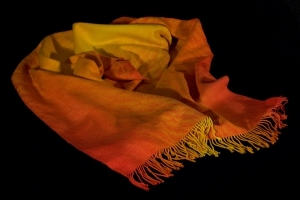 This shawl rose out of an unsuccessful attempt to weave the advancing-twill cocoon jacket published by Flavian Geis in Weaver’s magazine (can’t remember the issue).Â It was a beautiful jacket, with a warp that gradually changed colors from red to yellow and back again, and a weft that alternated between black and a sequence that changed from red to yellow and back again.Â The result was an beautiful jacket.Â I wove it up only to discover that, alas, my loom was too narrow! and the resulting jacket was too short for an adult.Â What a disappointment! I forged on.Â I had enough warp on the loom for three more shawls, so I wove two shawls with black weft with the intent of giving them away.Â Then I found myself looking at the pirns full of those beautiful red-to-yellow shades.Â I had hand-dyed 20 skeins of yarn in colors changing gradually from red to yellow, so close in hue that it was nearly impossible to distinguish adjacent stripes.Â I had enough left over on the pirns to weave one last shawl.Â Would it work?Â There was only one way to find out! The completed Liquid Fire shawl. Photo courtesy Joe Decker, Rockslide Photography. A closeup of "Liquid Fire". 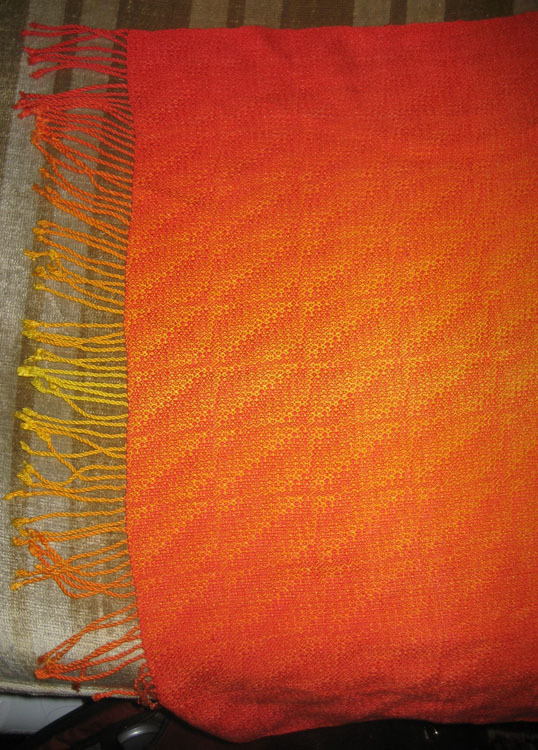 Here the weft is red, showing the advancing twill pattern clearly. Half the Liquid Fire shawl. This photo shows how the weft color changes gradually from red at left to yellow at the center of the piece, producing a starburst-like pattern. Liquid Fire on the loom (a Leclerc Diana). 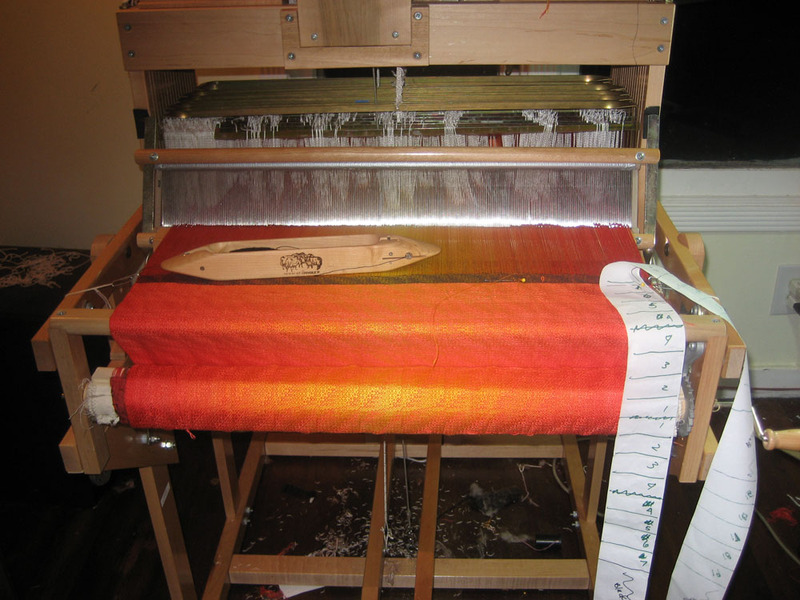 The paper tape on the right is a measuring-mechanism, that tells me how much I've woven, and when to change weft colors. Absolutely stunning. I’ve never seen anything like it before!